Many dive sites around the world boast garden gnomes - photographs and stories are swapped on a number of internet diving forums. "It's the funny thing with divers," said Paul Fray, diving officer for Kendal and Lakes Sub Aqua Club (KLD). "They do pop up in some odd places. "Mind, it's the best place for them because I think they look silly in a garden." Gordon Mackie, a diver for 43 years who teaches with Dive More Scotland, thinks the gnomes are "a good laugh". "If you take gnomes seriously then it's a bit of a problem," he said. Like many divers, he is familiar with the Wastwater gnomes. He knows the police removed them "so people wouldn't go looking for them" but said people just replaced them. "Also people do a bit of gnome napping," he said. "People go down and pinch your ones and stick them on their site. "Or, as has happened to some of mine, people take them on holiday and take photographs of them and send them back." The gnomes provide "something to look at" in areas where the alternative is "mud, mud and more mud", he said. And it is not just gnomes. He has seen old toilets, Christmas trees and, recently, a plastic skull which made him look twice. "Most of the gnome gardens tend to be planted well within sports diver range," Mr Mackie explained. "I tend to put mine all around the 20-25m depth which is accessible by inexperienced divers. It's a nice, safe depth." He says people might be tempted by the gnomes to go deeper than their experience allows but that the same applies to shipwrecks, often left for this purpose, which attract less criticism. About a decade ago there were several deaths at Wastwater. 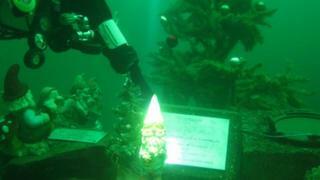 Police removed a gnome garden - with picket fence - after suspecting divers looking for them might have gone down deeper, or longer, than they were able. In 2005, the North West Police Underwater Search Unit heard rumours the gnomes had been replaced, deeper than the 50m (165ft) their code of practice allows them to reach unless specifically necessary. These days they are "not aware" of any problems with gnomes at Wastwater. A spokesman said they had "not attended any incidents relating to this issue for several years". But they warned they did not condone gnomes in the lakes and advised divers to not to put themselves at unnecessary risk. KLD diving officer Paul Fry said divers should always have a number of safeguards which include a written plan, risk assessment and diving in pairs. For deeper dives they should carry a small emergency cylinder, which will keep them breathing until they reach the surface, or an additional tank. He is not convinced divers who follow the rules should find themselves in difficulties if they go looking for gnomes which, in any case, he thinks are a "bit of fun" and not their main interest. Deep diving is inherently risky, he said, and the presence of gnomes is "incidental".